Learn to read in 20 lessons. This app is perfect for preschool and elementary age students. I would definitely recommend it as well for children with special needs. Win this app August 16th, 2016! I am so excited today to talk about READ. This comprehensive app teaches children to read in 20 lessons. It is a very organized system and I have tried many different reading programs but was most impressed with this one. 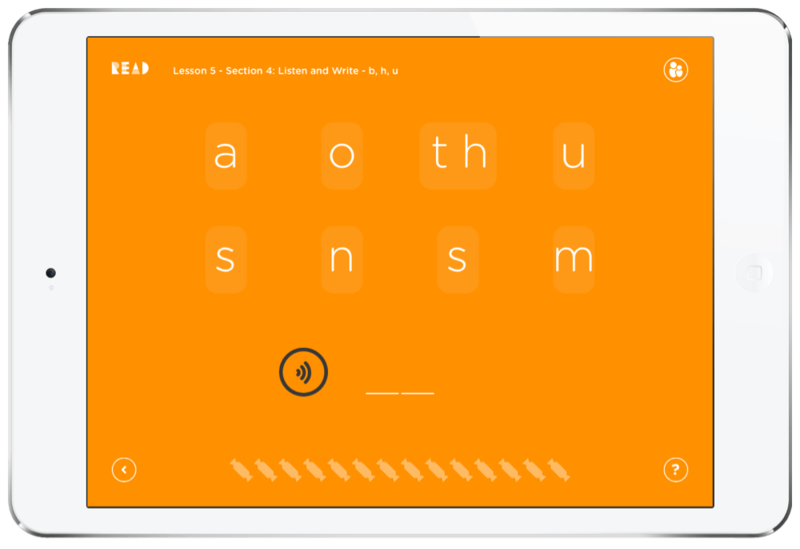 As the child navigates through the app, they can unlock each lesson one at a time while working on sounds, sequences, and reading. This app is designed for kindergarteners and elementary aged children. It blends two different curriculums including phonics and the whole language method. Together, this plan works to create a simpler, and more streamlined process. There are a lot of features that will support children with special needs as well. Even children who are older but struggle to read will still benefit this app. This app was created by Olivier Romanetti and One Tree Hill Studio. They offer educational apps for children. I have tried out their music4babies app as well which is also really cool and worth checking out. 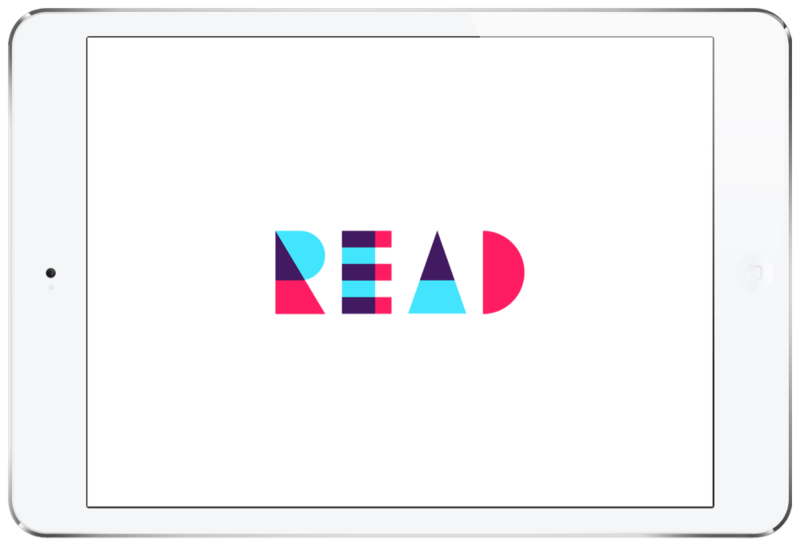 Let’s get started and talk about the features of READ. When you open the app, you will be brought to the main menu. 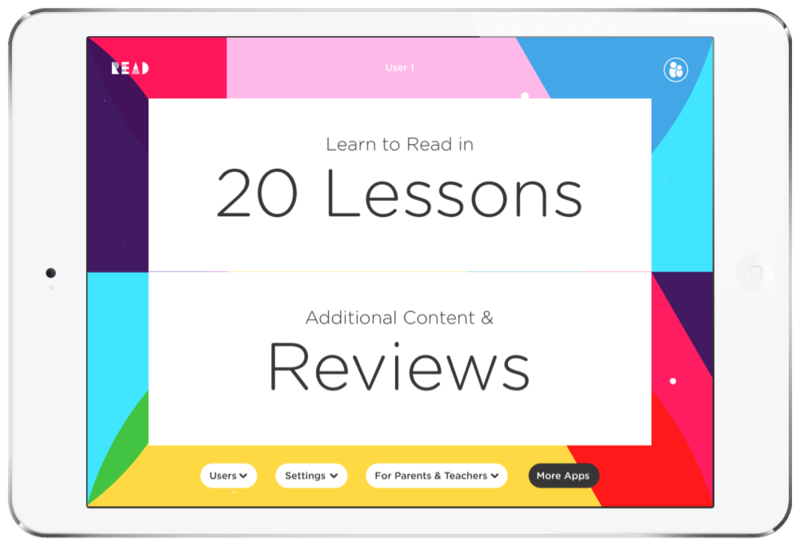 You can learn to read in 20 lessons, create a user profile, browse additional content and reviews, adjust the settings, or see resources for parents and teachers. At only $2.99, this app offers one of the best deals out there. It is packed with great features and optional resources. Everything included is intentional however so you will not find unnecessary extras. 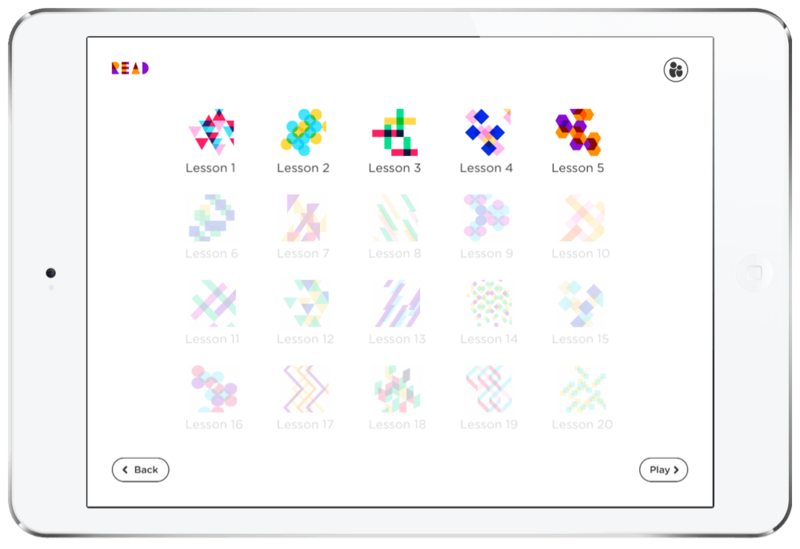 In the additional content and reviews section, you will find many of the activities that are available within the lessons. You can receive extra support in the upper right hand corner. This app is easy to use. The design is simple and your child will not have trouble navigating through it. There are a few distractions and the child can exit the levels during the session but overall I loved the design and wouldn’t find that a big concern. It is full of bright and very engaging colors. It is recommended in the information and help section when you get started that short daily sessions are the best way to keep a child motivated with this program. I found this to be true. Both of my kids tested this app out and I found it incredibly successful for both of them but their attention span and focus was best when we did 15 minutes a day. My 6 year old with high functioning Autism was grabbed by the colorful backgrounds. He was very motivated to unlock the next levels. It was a game to him. My four year was also very successful. He loved the simple questions and was great at listening to the letter sounds. Both of my children improved significantly while going through the levels. We have not finished all 20 lessons yet but have every expectation to finish them. There is an overview for each lesson. It also offers ideas for the parent to support the child outside of the app as well. I loved this. One small critique I would have is that, at times, it was difficult to distinguish similar letter sounds. My son and I struggled to hear similar sounds like a short “e” and a short “i” sound. He did once in a while answer incorrectly because of that. There is a settings menu with a lot of great options. It has parent controls set up and they are guarded by a math problem. Once you have accessed the features, you can choose a different voice, and language. You can also remove background music. In the voice settings, you can choose to speed up or slow down the speech by adjusting the words per minute. You can also adjust the pitch of voice. Slowing down the dictator and lowering the pitch greatly improved my ASD sons’s progress. He didn’t feel rushed or overwhelmed. He could process the information better. He could hear the sounds better. I have not seen these settings very often and would definitely recommend them to all storybook, or special education apps. They make a huge difference! Overall, I was delighted with this app. My son struggles with sounding out words. He excels at memorization and finding a program that would work for him and force him to work on phonics has been difficult. This is the first one that has brought true success. It is an app that will stay on my phone and iPad for a long time because of that. I would recommend it to all children learning to read at any age. I think that a 10-15 minute session each day will make the difference and help the child to not burn out. There aren’t a lot of characters or large incentives in this program but I found the ability to unlock new levels each time was helpful. My son was excited about that. I also liked that each activity was important and stepping him towards a goal. Older children with special needs that do not know how to read will also benefit from this app as well. It is not too whimsical and it is interesting without being childish. I would recommend a little clearer dictation. Some letter sounds were hard to hear the difference between them. Other than that, I was extremely satisfied. At the time of writing this review, READ retailed for $2.99. Be sure to also check out our giveaway on the Touch Autism Facebook page. Download READ in the App Store today!